Jessie Vargas has been at this for a while. He's gotten paid to punch people for just short of 10 full years, has held world title belts in a pair of weight classes and was a member of Mexico’s 2008 Olympic team – though his amateur trip to the Summer Games in Beijing was canceled by a loss in a regional qualifying tournament. But even as he’s labeling himself a “young veteran” these days, Vargas is simultaneously discovering it’s not too late for even a 29-year-old dog to learn new tricks. So rather than spending every waking moment obsessing about Saturday night’s crossroads date with Adrien Broner at the Barclays Center in Brooklyn, the old-school millennial is going newer school when it comes to getting pre-fight peace of mind. It’s a switch from anxiety-laden years past, he said. “I was the type of fighter that just focused on the fight. Focused on the task at hand every minute of the day,” Vargas said. “But that also could be stressful because you need some time away from it. I’ve found the perfect route. I’m a little older now so I know exactly what I should be doing and thankfully it’s all working out in my favor. Just knowing how to mix it up. It’s the 31st time through the pre-fight wringer for Vargas, who opened his career with 26 straight wins and had captured both the IBO and WBA versions of the 140-pound championship by the end of 2014. He’s just 2-2 in the three-plus years since, however, with high-profile misfires against Timothy Bradley (UD 12) and Manny Pacquiao (UD 12) essentially dwarfing the positivity generated by one-sided victories over the more pedestrian likes of Sadam Ali (TKO 9) and Aaron Herrera (UD 10). The recent tumult has been evident in the corner as well, where Vargas has worked since 2014 with Roy Jones Jr., Erik Morales, Dewey Cooper and Mike McCallum as lead trainers. Previously, he’d also teamed with Roger Mayweather, Robert Alcazar and Ismael Salas. The Broner fight will be his second with McCallum, a 61-year-old Jamaican who won titles at 154, 160 and 175 pounds across a career that ended in 1997, when Vargas was 7 years old. Upon learning they’d be working together, the younger man quickly got himself up to speed on McCallum’s most significant victories – against Milton McCrory (TKO 10) and Donald Curry (KO 5) at 154, and over Herol Graham (SD 12), Steve Collins (UD 12) and Michael Watson (KO 11) at 160. McCallum also went 0-2-1 in three fights with James Toney, and lost a decision to Jones in 1996. “He pushes me, knowing the limits, which is nice,” Vargas said. “It’s nice to have someone who actually knows what they’re doing, has been there, done that, has suffered through it and has been in my position and feels comfortable to tell me what to do and why, because it worked for him. The technique is always different, the mindset is different on when and how. How exactly to do it. The Saturday date with Broner wasn’t originally on Vargas’ agenda, but he was pulled into the discussion in early March when original opponent Omar Figueroa pulled out with a shoulder injury. Broner has lost three times in nine fights since beginning his career with 27 wins and titles at 130, 135 and 147. He picked up a fourth weight class belt – at 140 – with a defeat of Khabib Allakhverdiev (TKO 12) in 2015, but dropped it six months later after failing to make weight for a defense against Ashley Theophane (TKO 9). He’s 1-1 since, winning a split nod over Adrian Granados and dropping a wide one to Mikey Garcia. “They called me for the fight and I was excited for it. I liked it from the get go, to be honest,” Vargas said. “(It) was an interesting fight for the fans and it was a great fight for me. He has great popular demand when it comes to the fans. I do as well, so we brought that to the table. He has a nice style. “He’s a challenging fighter. He’s a fan-friendly fighter. He comes to fight. I figured that the fans would enjoy it and I wasn’t wrong. Everybody’s excited for it and come (Saturday) the only thing I have to do is come out victorious. That way we can make it a great night. I’m going to take control from the beginning. We’re going to take charge and make sure of it for every minute of the fight. Vargas will enter as the 10th-best welterweight on the planet according to the Independent World Boxing Rankings, while Broner is ranked fourth in the world at 140 pounds. Two of Broner’s losses came when he weighed-in at 143½ (UD 12, Shawn Porter) and 144½ (UD 12, Marcos Maidana) pounds, respectively, and he’s won four other fights above 140 pounds. Vargas stands four inches taller (5-foot-10 to 5-foot-6) and has a two-inch (71 to 69) edge in reach. And a win, especially a convincing one – according to the larger man – would be precisely the catapult he’s seeking toward a full-on career reboot. That win, he said, would also mean a subsequent quest for additional welterweight jewelry – particularly that which is now held by Keith Thurman. 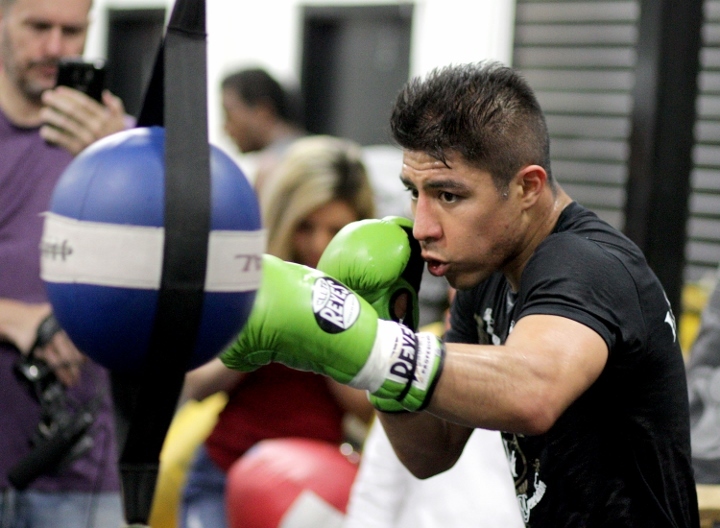 “It’d push me toward the biggest fights out there for the fans,” Vargas said. “That’s my No. 1 priority. I want the WBC and WBA belts. Whoever has it at that time, I’m going to hope and try to make the fight happen. Overall, it’s up to my advisors. I’ll let them negotiate for me. I’ll let them figure out the next move. But if it was up to me I’d go for a belt.